UlstermanBooks.com > Entertainment > Rosario’s Revenge Is Coming Soon! If you nominated Rosario’s Revenge during its Kindle Scout campaign you likely have already received a message it wasn’t selected as a winner for publication. I knew it was a bit of a long shot going in as the first in the series, The Writer was already an earlier Kindle Scout winner. I was hoping to have the series be a two-time winner, but alas, it was not to be. 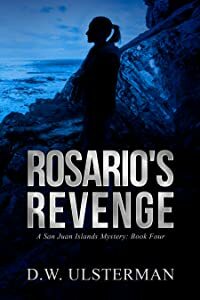 That said, Rosario’s Revenge is still on track for publication in the next two weeks and will be made available at Amazon at that time as book four of the ongoing San Juan Islands Mystery series. Thank you again to all of you who took a moment to nominate Rosario’s Revenge during its Kindle Scout campaign. Get the entire San Juan Islands Mystery series today and save 30%!